The Galleria is under the ownership of Land Securities and was opened in 1991. 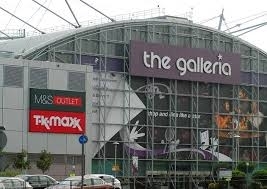 The Galleria is a designer outlet centre situated in Hatfield, Hertfordshire; located 6 miles north of the M25 motorway. It has been critically regarded as one of the best outlet centres in the South East of England and sits within a perfect position to get the largest optimum intake, with 7.3 million potential shoppers within a 60-minute drive; this is due to the centre’s location being just north of London, situated on top of Hatfield Tunnel which houses the A1(M) motorway. However it seemed like the Galleria was not going to come about, when plans were first rejected by Welwyn Hatfield District Council, in 1984, and was followed by large-scale dissent towards its building, up until the present. Several social groups signed a petition suggesting that it would be an eyesore. However, by the time of construction the perspective had changed and the realisation that it would bring a wide prosperity in terms of a multitude of jobs and increased local business from visitors. The Hertfordshire County Business Monthly released in March 1990, that this would be an ultimate shopping experience, unrivalled by the local towns. By the time construction had taken flow in 1991, the large-scale dissent had been seemingly stunted, people had realised the importance and money that The Galleria would bring to Hatfield; it has now become synonymous with Hatfield. The Galleria’s life in Hatfield was not all plain sailing however; it did not come without its fears of collapse; even to the present day with our economic climate. One thing that can be definitively concluded is that the Galleria had a considerable amount of opposition when plans were first suggested and until it was built. However, The Galleria has now become an integral part of Hatfield, used by local people, university students during term time and people coming from other towns and cities to use its facilities, whether they frequent the abundance of shops or visit the variety of world restaurants in the food court. Everything is there at their fingertips. August 7th 1984 Carroll Group of Companies- in partnership with Welwyn Hatfield District Council. This page was added on 26/03/2013.